A legendary eco-philosopher and a British sustainability activist present a personal way forward through despair over ecological crises. 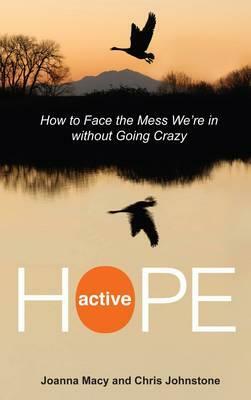 Active Hope encourages us to find our power to respond to our concerns about the world. Active Hope is about finding, and offering, our best response to the crisis of sustainability unfolding in our world. It starts by accepting that the challenges we face can be difficult even to look at: climate change, the depletion of oil, economic reversals and the die-back of our natural world act together to create a planetary emergency of overwhelming proportions. the book offers an approach that strengthens our capacity to face disturbing information and respond with unexpected resilience and creative power. Drawing on decades of experience running workshops in an empowerment approach widely known as the Work that Reconnects, the authors guide the reader through a transformational process informed by mythic journeys, modern psychology, holistic science and spiritual perspectives. this process equips readers with tools to help them face the mess we're in and find and play their role in the collective transition, or Great turning, to a life-sustaining society. At the heart of this book is the idea that Active Hope is a gift that is not only given but also received. the journey of finding, and offering, our gift of contribution helps us to discover new strengths, open to a wider network of allies and experience a deepening of our aliveness. When our responses are guided by the intention to act for healing of our world, the mess we're in not only becomes easier to face, our lives also become more meaningful and satisfying.